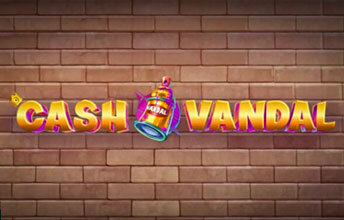 Play n Go are rocking the slots like a vandal in this release. Sorry – just couldn’t get Vanilla Ice out of my head. The action takes place on the outside of tube trains which make a nice canvas for the local graffiti artists. Calling at London Paris and Berlin. The game takes place on a 4-reel setup with 10 pay-lines. Unusual but it adds to the volatility and gives you space for the 3 feature triggers. 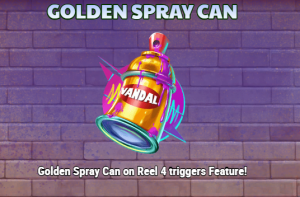 The Golden spray can only appear on the 4th reel. Landing the Golden spray can without smaller spray cans will trigger a re-spin. 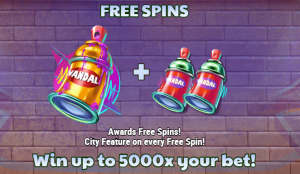 Land 1 or 2 small spray cans during the res-pin and you’ll trigger the enhanced free spins bonus rounds. 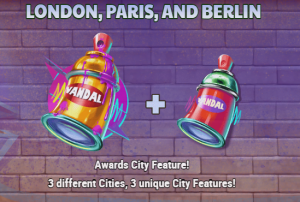 A Golden spray can on reel 4 and a smaller spray can anywhere on the reels will kick in the City feature. Each City has a unique feature. London – Up to 9 mystery (transforming) symbols will be added to the reels. When the symbols land they will each transform into a single symbol. Get all 9 on a 10 line slot and you’re looking at a very nice payout. Paris – The reels will drop in a colossal symbol across the first 2 reels. 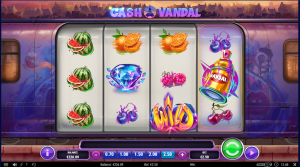 Berlin – Random wilds are added to the reels. The features can be a little hit-and-miss of course given their nature. London has been far and away the most lucrative but can also be frustrating depending on the number of symbols transforming and the eventual symbol that they transform into. Paris has been the most disappointing for me but then I’m not a big fan of colossal symbols – too much blocker potential. Along with the top paying symbols below 4 wilds anywhere on the reels will give you a 50x bet win. There’s a good bit of potential in this game. For the vast majority of providers this would be a win. This is Play n Go though and we’ve come to expect something better from them. Give it a go, it’s likely to polarise opinion as much as graffiti does. We’ve certainly played the game a fair bit on our streaming sessions, so opinion is divided within the SlotMad team. You can join us on any of the below Streams from 2 or 5pm every weekday!